Firstly, Central Car Auctions are bigger than the rest. Many other car auction houses spread their sales out over several different locations. While this can make it handy for you to get to an auction nearby, when you’re there you’re only viewing a small selection of vehicles, so you can often go away disappointed having had a wasted trip. You then need to visit another auction, and another, until you find what you want. In addition, if you’re in the trade and looking to buy several vehicles, you’ll certainly be wanting a larger selection. This is where Central Car Auctions excel. CCA have only one site, a huge 14 acre complex in Glasgow. With auctions every Monday, Wednesday and Friday, over the course of just one week you could have the opportunity to bid on more than 2000 vehicles! CCA make sure that there is a wide range of makes and models available at every auction and there’s plenty of cars to suit every budget too. They also track AutoTrader’s Top 10 most searched for cars and ensure that there are plenty of examples of these in their sales. If you’re a trader buying to order, you will know how helpful this is! The huge quantity of vehicles in every auction gives members of the public a wider choice, and for the trade it could mean a massive saving on both time and cost for transporting the vehicles back to base. This is aided further with fixed price transportation available direct from CCA to Scotland ports or direct to Northern Ireland. Being located in Glasgow, CCA is easily accessible from the whole of the UK and it’s even just a short trip from Northern Ireland. The site is close to rail and air links and it’s just minutes from the motorway. You’ll meet all types of people at a CCA auction. From families looking for a new car to traders from the south taking advantage of the cheaper prices here up north. Many people don’t realise it, but cars cost considerably more in England than they do in Scotland. Taking a trip up to Glasgow could work out to be well worth it financially! The next salient point is the auction environment itself. If you regularly visit car auctions, you can soon begin to get fed up of standing around in the cold. With a CCA auction, you don’t need to worry about the weather. The halls are fully heated and vented so you can bid in comfort on even the coldest winter days or a stifling summer afternoon. CCA understand that visitors want to enjoy their day at the auction, it doesn’t need to be an ordeal, so they’ve invested heavily in making the experience a pleasurable one for everyone. The CCA experience starts as soon as you arrive with complementary parking for all. There is free Wi-Fi throughout the whole complex and there’s also a cafe serving delicious hot food and snacks. When it comes to the auction itself, there’s no letting up on the little extras that Central Car Auctions provide. You can view the auction catalogue, view vehicles via our free CCA App or bid for vehicles online via their LIVEBID facility. Even if you don’t have a mobile device with you, that’s no problem, CCA also provide a bank of PCs for your use. If you prefer to bid directly, then you’ll do so in the main hall. This is no converted barn or hangar, the building has been designed specifically for the purpose of car auctions, and it shows down to the last detail. There’s plenty of comfortable seating, and for traders there’s a great feature in the form of a unique twin rostrum facility, so you can literally bid on two cars at once! Why have CCA done all this? Well it’s fairly simple. It’s what people asked for! Central Car Auctions pride themselves on listening to what people want. Over their 50 plus years in business, they have always taken on board what their customers want and need, and adapted the business accordingly, giving us what we have today which is a pretty amazing auction experience that’s more like a business-like day out than a chore. Combine this with the lowest fees in the UK and it’s no wonder CCA have grown from strength to strength over the years. CCA make auctions accessible to all. 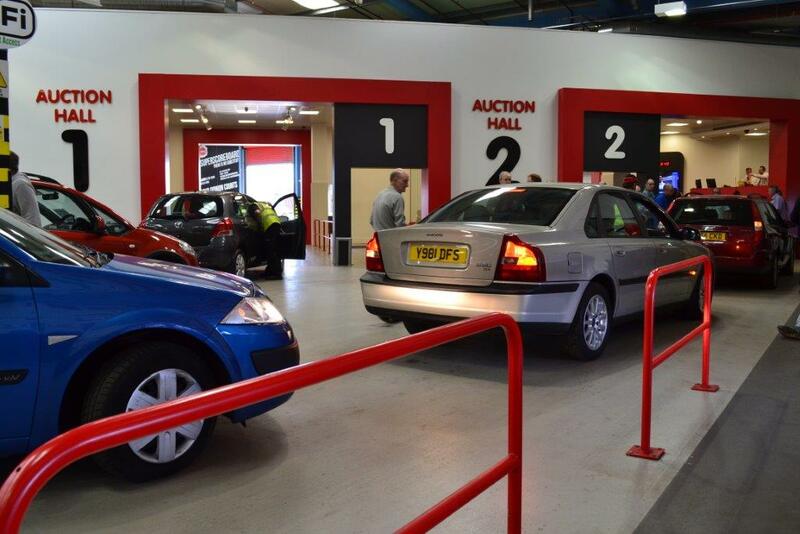 If you’ve never been to an auction before then make Central Car Auctions your first choice. You’ll be warmly welcomed, and the highly trained and knowledgeable staff are always on hand to guide you should you find the whole auction experience a little confusing at first. In the meantime, do check out the website at www.centralcarauctions.com. Here you can view the cars, download the app, and read about all the facilities available on site. There’s also full information regarding how the auction system works, perfect for newbies, and all the fees are clearly explained. There are no hidden costs buried deep within small print here! Our final suggestion is to get to a CCA auction early. Soak up the atmosphere, browse the vehicles at your leisure and enjoy your day. There are regular exhibitor stands to browse, and don’t forget to grab a cuppa at the cafe – the coffee is particularly good! We believe Central Car Auctions are paving the way for a better and more comfortable auction experience. Eventually, all the other leading auction houses are likely to see how well it works and follow suit, but in the meantime, experience it for yourself now at CCA and catch a glimpse of the future of car auctions. We know you’ll have a great time and profitable experience in Glasgow! Call further information, please call Central Car Auctions Sales Team on 0141 773 6000.